SCVHistory.com LW2024 | William S. Hart | Hart and the 10 Millionth Ford Model T, 1924. In a Ford Motor Co. publicity photo, William S. Hart inspects the 10 millionth Model T to roll off the line in Highland Park (then on the outskirts of Detroit) in June 1924. The car went on a cross-country tour from New York to California via the Lincoln Highway. Note the ranch house behind the gate to Hart's Horseshoe Ranch in Newhall, which Hart purchased in 1921. The 1927 Hart Mansion doesn't yet exist. Originally priced at $850 when the first 1909 Model T Touring Car was produced Oct. 1, 1908, prices for the 1924 "Tin Lizzie" hit an all-time low of $290 on Dec. 2 of that year ($375 with factory starter and demountable rims), thanks to improved assembly line production methods and simplifications to the car. When production ceased in May 1927, slightly more than 15 million Model Ts had hit the (mostly unpaved) streets of the world. On Dec. 2, 1927, Henry Ford's "universal car" would be replaced with the Model A. The ten-millionth Ford Car left the Highland Park factories of The Ford Motor Company on June 4th, 1924. This is an industrial achievement of profound significance. It vividly portrays the magnitude of The Ford Motor Company's contribution to modern civlization. It symbolizes the universal acceptance of a worthy product, rightly made, honestly sold, filling a basic human need, and so economically manufactured that it is within the means of the millions. It is a triumph of useful service as well as of volume production. It is truly measured by its part in increasing man's productiveness, prosperity and happiness. Detroit, Mich., June 14  — (Special) A new and outstanding achievement in the automobile industry of America was attained here recently when the ten-millionth Model "T" Ford car left the final assembly in the Highland Park plant of the Ford Motor company. The motor, bearing the number 10,000,000 was completed in the morning, and reached the car assembly line that afternoon, and was assembled into a touring car, the most popular of all Ford body types. In celebration of having attained a 10,000,000 production record, the company announces that Ford car No. 10,000,000 will make a coast to coast trip as signifying the nationwide popularity of the Ford car and its appeal to every class of driver. The car will be shipped to New York within a day or two and leaving there will be driven across the country to San Francisco. The Lincoln Highway has been selected as the official route of travel and stops will be made at most all the towns along the line. 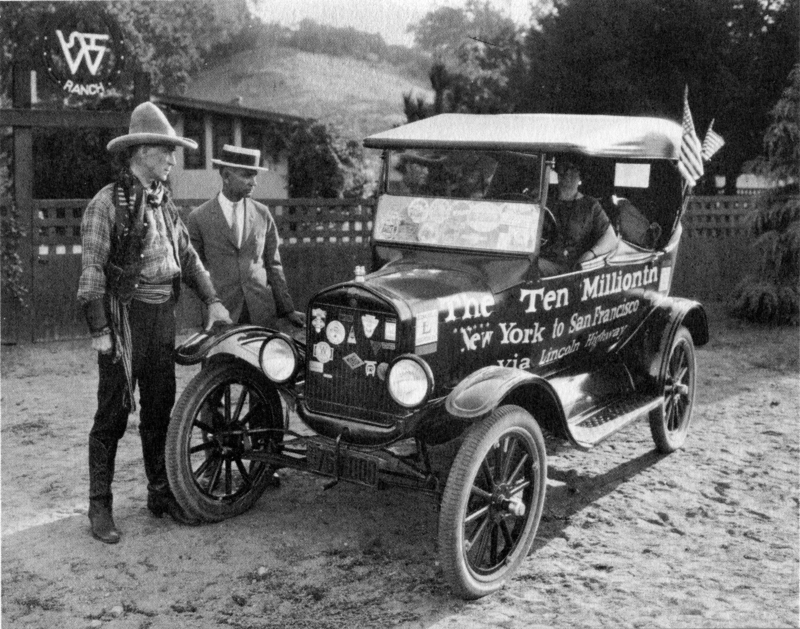 Frank Kulick, who years ago attained fame and broke many records as the pilot of Ford racing cars, will be at the wheel of the ten-millionth Ford, during the trans-continental trip. Model "T" Ford cars are today in use in every country on earth and the unusual success which has attended the Ford Motor company dates principally from 1908, when the Model "T" was developed and introduced on the market. The company was among the first to adapt the unit power plant and the left-hand control, and it was the originator of such fundamental principles as the removable cylinder head, three-point motor suspension and torque tube drive, all incorporated in the Model "T" and which have since been generally adopted in the automotive industry. The correctness of these basic features has been strikingly proven by the fact that in the entire ten-million production, while improvements have constantly been made, there has never been any deviation from the original principals [sic] of the Model "T."
Previous to the time that the Model "T" was introduced the company had built and sold approximately 25,000 Ford cars of other models. The first Model "T" was completed Oct. 1, 1908, and it was seven years later, Dec. 10, 1915, when Motor 1,000,000 was produced. Since then under an ever increasing demand, production has steadily grown until a new output record was established in turning out the last million cars in 132 working days.